Yves here. If nothing else, be sure to look at the chart, which is the second graphic in this article. It presents a factoid that has been remarkably absent from discussions about affordability and access to healthcare. The sidebar on the rise in employer-sponsored premiums is particularly timely. The 2017 Kaiser Family Foundation/Health Research and Education Trust annual employer survey is due out Tuesday at 12:30, and wlll no doubt be accompanied by Democratic promotion of a “historically low” rate of private sector premium increases. A colleague will be looking at the full study when it lands tomorrow, and we’ll have a quick take on the real rate of premium increases. 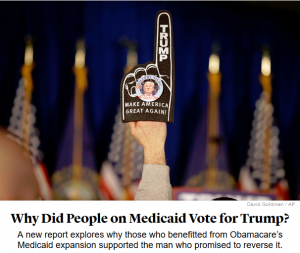 a question that’s baffled health reporters in the months since the election: Why would people who benefit from Obamacare in general—and its Medicaid expansion specifically—vote for a man who vowed to destroy it? Vox’s Sarah Kliff found these voters in Kentucky, more than once. Abby Goodnough and Reed Abelson did too in North Carolina for a front-page Sunday feature in the New York Times (3/7/17). Jessica Contrera found them in West Virginia for the Washington Post (3/11/17). The LA Times’ Noam Levy (2/24/17) found them in Florida. The Kaiser Family Foundation held monthly focus groups with them in Pennsylvania, Ohio and Michigan, allowing KFF president Drew Altman to opine on the Times’ op-ed page (1/5/17). Like Kliff, ABC (2/27/17) found them in Kentucky, and CNN’s Dr. Sanjay Gupta (1/6/17) went to Florida. Reporting stimulated comment from the Post’s Dana Milbank (12/20/16) to the Times’ Paul Krugman (3/14/17) to influential liberal sites like Daily Kos (1/28/17), Salon (12/15/16) and Digby’s Hullabaloo (3/13/17). They spoke anxiously about rising premiums, deductibles, co-pays and drug costs. They were especially upset by surprise bills for services they believed were covered. They said their coverage was hopelessly complex. Those with marketplace insurance—for which they were eligible for subsidies—saw Medicaid as a much better deal than their insurance and were resentful that people with incomes lower than theirs could get it. They expressed animosity for drug and insurance companies, and sounded as much like Bernie Sanders supporters as Trump voters. The most damaging effect of singling out this minuscule fraction of the electorate and questioning their motives was the license it gave media to ignore the realities faced by the rest of American working families and to distort the politics of the Affordable Care Act. Here’s who the media failed to cover: the 177 million Americans who get their insurance through job-based coverage. They are Clinton voters, Sanders voters, Johnson voters, Stein voters and, yes, Trump voters. Media generally overlook the crushing impact the ACA has had on their health insurance. To the extent people with employer-provided insurance are interviewed on healthcare, they are often wrapped in the wrong frame—that their concerns about the ACA are irrational, because the ACA didn’t impact people who were already covered. The ACA imposed an excise tax on their benefits, the simple threat of which caused 73 percent of employers to cut benefits, raise out-of-pocket costs or make plans to do so. Their deductibles increased 89 percent, while their compensation went up just 14 percent. When they can afford to get care, they see a stranger: 15 percent of Americans lost access to one of their doctors because their insurance network changed in just the last year. Even though the US has the lowest rate of un-insurance in our lifetimes, 31 percent of Americans told Gallup they either skipped or delayed necessary medical care last year because of costs, the majority for serious conditions. The Census Bureau reports that 11.2 million Americans live in poverty due to out-of-pocket medical expenses. In short, the majority of Americans who get their insurance through work are facing an escalating crisis of underinsurance, brewing under the ACA and not addressed in the GOP’s proposed replacements. 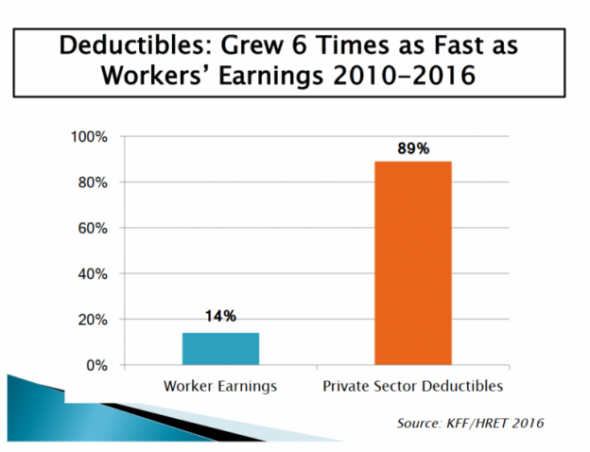 With more than a third of workers carrying deductibles of $1,000 or more, and 20 percent now in plans linked to Health Savings Accounts, few Americans’ benefits look much like 2010. The deepest flaws in the ACA are the fruition of President Obama and congressional Democrats creating a law that counted on controlling costs by forcing employers to make American workers pay more so they would use less healthcare, instead of having millionaires pay their fair share. In particular, the misleadingly named “Cadillac Tax” is putting enormous pressure on workers’ out-of-pocket costs, based on the false notion that Americans use too much healthcare and that giving employers and workers more “skin in the game” will shrink overall costs—as if shifting costs to the least-powerful players in the system weren’t a recipe for boosting rather than curbing healthcare inflation. Hospitals have been on a 20-year merger spree. Now they’re buying up doctors’ practices and charging monopoly prices for both hospital and physician care. Drug companies are gaming patent law and charging monopoly prices, refusing to reveal any justification for their larcenous prices. Insurance companies are passing provider and drug prices to their ratepayers and skimming billions of dollars off the top of an ever-growing pie. These trends are covered, but only episodically compared to the avalanche of coverage of the ACA marketplaces and Medicaid expansion. The New York Times(12/15/15) and others covered a groundbreaking study of 3 billion insurance claims that showed that hospital market power and prices, not utilization, are the primary drivers of private-sector costs. 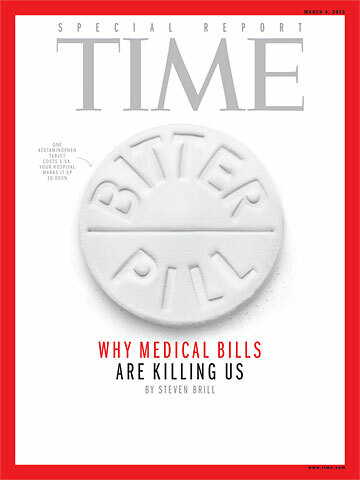 Steven Brill (Time, 3/4/13) has relentlessly exposed extreme hospital prices, and pharmaceutical price-gouging is a national story (e.g., New York Times, 4/26/16). But overall, the media allows Washington politicians to frame the “reform” debate as a false choice between a status quo and Republican reaction—in other words, between a system that punishes working-class Americans and even more punitive proposals. There are plenty of policy tools to combat healthcare corporate monopolies—from Nevada’s first-in-the-nation law curbing Big Pharma’s price-gouging on insulin, to Maryland’s successful hospital rate-setting system, to Hawaii’s employer mandate—or, of course, creating a universal Medicare-for-All (“single-payer”) system. However, all of these require politicians to put working-class Americans before Pharma, hospital and insurance industry profits. Unfortunately, few in Washington, DC, have a taste for any change that isn’t paid for by poor and middle-class families, and corporate media allow politicians to get away with it. Republicans’ simplistic market nostrums and fixation on tax cuts for millionaires have already run smack into the brick wall of reality. The Democrats’ turn is coming. Standing back and watching GOP infighting may be satisfying, but until Democrats acknowledge the direct harm that their healthcare reforms have inflicted on American families, and the even greater harm that failing to include any restraint on the industry in the original bill has caused, Democrats will continue to suffer apparently mystifying failures at the ballot box. The media’s myopic focus on a tiny slice of Trump voters, singled out for mockery and disdain, has enabled Democrats’ denial of the true practical and political consequences of a flawed law under whose purview the family fortunes of the majority of Americans have continued to decline. Private MedicareAdvantage plans are the worst screwing of our government since the WS screwing of 2008+. Th MedicareAdvatage scam makes Bush’s MedicareRX scam look like a Sunday school picnic — it front-ends the withdrawal (really ‘looting’) of government Medicare funds and will blow-up as bad as the crooked banks in ’08!!! Which, by the way, is a primary reason so many people who know of elderly relatives’ economic struggles are resistant to Medicare-for-All: sadly they don’t realizing that — if ever enacted as proposed — it would do away with those deliberately deadly co-pays. Loren, I’ll research the issue of MedicareAdvantage relative to co-pays and get back to you. Are you saying that copayment amounts to 20 to 50% of the medical service charge after the Medicare adjustment of the Bill? IE. of the net net charge? Which, BTW is hard to believe. There is not question — because of the MedicareAdvantage thieves (and their slight of hand in withdrawing at the ‘capitation’ rate) that they are the primary looters of Medicare funds. I am not trying to be critical of the deluded and conned people who are scared and scared into signing-up for the predatory Medicare Advantage plans — but I’m only angered at the thieves and their Congressional accomplices who who designed, built, and profit from looting dry the Medicare public insurance fund. Please share with me an example of a medical service event of yours (above a simple ‘office visit’) in which you can detail your gross medical service fee, Medicare’s adjustment/reduction of that gross amount, and your co-pay amount. (Obviously, without disclosing any of your private information, nature of the service, or your own identity). Thanks for your concern in bringing up this aspect of the Medicare Advantage process — and I will promise to do a serious investigation though my sources, and I’ll get back to you online or via email, if you prefer. Secondly, not all Medicare Plus providers are for-profit insurers. Kaiser-Permanente is non-profit, and Group Health Cooperative, as its name implies, was first a co-op, then a non-profit before it was bought by Kaiser this year. The terms of the sale are of course secret, so there is no way to know which former Group Health executives profited or by how much. (Though I was a voting member of Group Health, I was nevertheless denied this information, as I assume were any others who requested it.) Kaiser remains officially a non-profit, but it is increasingly apparent that under the moral imbecility of Capitalism, a so-called “non-profit” is as profitable for its upper executives as any conventional Ayn-Rand-minded corporation. Thirdly, personal experience. I moved to Seattle from New York City and joined Group Health as a political statement in 1972. Though I was a typically healthy 32-year-old heterosexual male. I was also a Marxist (as I am now and have been since my teens), and the co-op was the closest thing to genuinely socialized medicine available anywhere in the USian homeland. Twenty years later, disabled and on Social Security, I could have reactivated my Group Health membership via its Medicare Plus program, but in my first years on Medicare (stupidly) chose not to do so. As a consequence, when severe chest pains sent me to Olympia’s Capital Medical Center for perhaps five hours — the problem was gastrointestinal rather than cardiological — I was suddenly approximately $12,000 in debt, and only about $7,000 of it was covered by Medicare. This was a totally ruinous debt that took me nearly a decade to pay off. Needless to say, I rejoined Group Health via its Medicare Plus program, which for dues of $5 per month provided me at a huge discount all the services Medicare provides at market prices — for example, a routine doctor’s office visit under Medicare was billed at $250, for which the co-pay was $50, but at Group Health this cost me only $5. Later of course as the Bush League turned Medicare Plus into Medicare Advantage — with the “advantage” obviously going to the insurance barons and the prescription drug lords — the Group Health prices rose accordingly. Present rates, unchanged after KP acquisition, are $10 copays for most office visits, lab tests and x-rays; $50 copays for specialist visits (which is why, though I learned in 2015 I am slowly dying of congestive heart failure, I will never be able to afford to see a cardiologist); $50 copays for urgent care; and an $85 copay for any emergency room trip that does not result in immediate hospitalization. My monthly dues are now $84, but even these prices are enormously lower that what Original Medicare charges. Indeed I do not now know anyone on Original Medicare; my 89 senior-housing neighbors are either on Medicare supplemented by Medicaid or are on Medicare Advantage as I am. While the foregoing is an adequate summary, there are many more relevant details that are literally too complex to commit to readily understandable prose — never mind I spent most of my life in newspaper journalism and am an award-winning editor and writer. Obviously this is deliberate, yet another tactic by which our infinitely evil Capitalist slavemasters prevent us from discussing or even acknowledging the true depths of our oppression. If you want more information, I suggest you go online to the Kaiser Family Foundation, which is the most complete (and genuinely unbiased) source on the USian health “care” atrocity available. In any case this answers your question as best I can in the available time. (I edit, design and produce the monthly newsletter for the senior housing complex in which I dwell, plus do about 50 percent of the writing, 85 percent of the photography and 100 percent of the typing. I also write an emphatically Marxist blog which the present venue will not allow me to mention by name but which has a small, regular, perhaps even devoted international readership.) Neither of these activities will ever generate any income, but they do sustain my intellectual acumen even as my physical strength dwindles toward that microcosm of apocalypse known as death. I’ll utilize the Kaiser Family Foundation on-line site for research on Medicare Advantages actual advantages in lowing copays. Thanks much for your background, abuse by the system, for which I sincerely sympathize with you, and for having focused me on this aspect of why folks look to MA for advantages of which I was unaware. Yes, the co-pay for services with original medicare range from 20% for inpatient to the 50% or more as quoted. I personally had a ‘minor’ outpatient surgery in 2011 for which I had to pay 20% of the “discounted” cost. After that I signed up for a ZERO extra premium “Advantage” plan that in 2012 allowed me to be charged only 10% of the cost of a 2 day stay in a hospital and one stent. “Retail Cost” was $250,000 — discounted by the insurance to $22,000 of which I had to pay $2,200. Medicare, Medicaid and Medicare advantage are the worst, most punitive implementations of “single-payer” systems on the Planet. That’s why I’m begging activists to DEMAND that congresscritters pass S.1804 and HR676 and make them even BETTER!